Seymore Snowman measures about 15" tall. He has a LONG homespun hat with a rusty star tied on. His hat is so long it touches the table! Seymore has vintage buttons for his eyes and a rusty square nail for his nose. His mouth is a row of french knots. 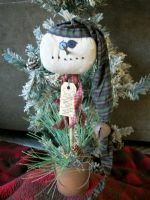 I have placed Seymore in a rusty tin pail and given him some long needle pine for a fantastic winter look! What a great snowman to have out all season long. You can see Seymore in the 2011 December/January issue of the Country Sampler Magazine. $32.50 FREE SHIPPING IN THE US 48. Others email me for shipping costs.